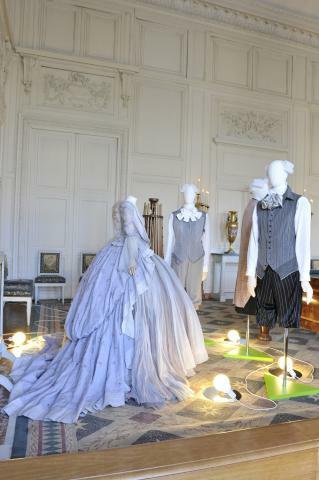 Paris Versailles Petit Trianon - Breguet hosts Haute Couture review July - October 2011. In a legendary moment of Fashion History. Breguet founded in 1725 and once watch makers to Louis XVI and Marie - Antoinette hosted a retrospective of Haute Couture in le Petit Trianon, Marie-Antoinette's play-home. Breguet have contributed massively to the cost of the restoration of their former patroness' home and it's largely thanks to the House that le Petit Trianon is open again in such marvelous condition. Breguet are a rare survivor from the fading days of the Bourbon House in pre-revolutionary France. To survive the Terror and the ups and downs of history since is no mean feat and this excellence blooms into generosity in their celebration of other notable artists works. 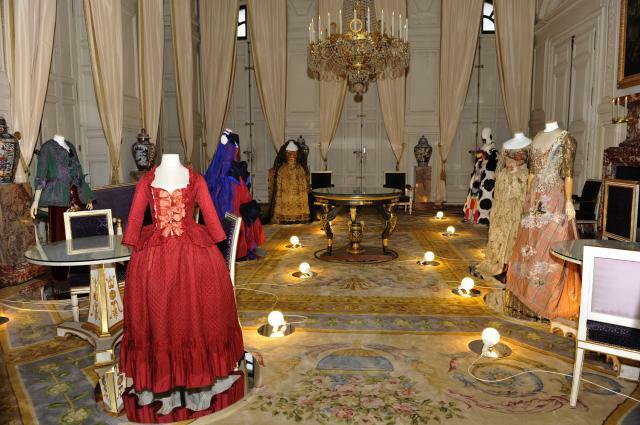 Once inside the Trianon itself the exhibition opened with dresses displayed in the Salle d' aides de camp. Clothes were chosen that echoed in many cases the style of the 18th Century. Who better to open the collection than Vivienne Westwood?! The first 'passage' on display was a from Dame Vivienne's 1995-96 Autumn Winter collection " Vivre la Cocotte". Alongside it was a piece by Alexander McQueen, passage (or look in English 26) from the Autumn-Winter 99-00 season. Alongside the contemporary works influenced by the 18th Century was also the real thing. 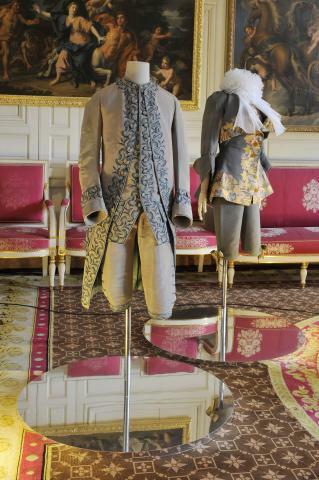 It was fantastic to see real men's tailoring from the 18th Century for the Royal Household and courtiers positioned in the rooms. The walls were decorated in vibrant reproduction wallpapers and stencil drawings of views of the parkland hang over them. 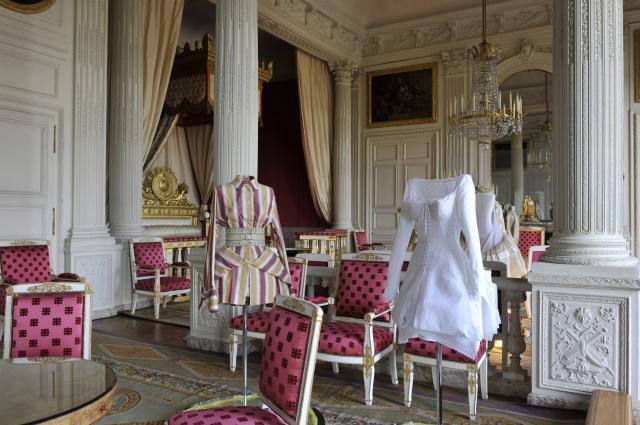 A you passed through more rooms, more dresses from the 'Vive la Cocotte' collection were displayed. Through into the Salon des Glaces (Hall of Mirrors) and CHANEL took center stage. A stunning line up of dresses greeted us that I looked at for as a long as possible. The looks were from Haute Couture Spring-Summer 1985 (several from this season including a Wedding Dress) and Haute Couture Autumn-Winter 92-93 and 97. Several looks from Spring - Summer 2005 were also included. I was really captivated by looking at these dresses with so much light dancing around the room. French children were playing in the spaces where there were not many grown ups and although, yes it was Haute Couture being viewed in a Palace annex there was a very fun 'light' atmosphere. So many people were looking at the clothes with sheer enjoyment. It was quite celebratory. I particularly adored a Blue-Aqua dress from CHANEL in that room. Above is an image taken by me of L' hameau en route to the Petit Trianon House. Now a coffee house I found it just as charming as the other much grander builidings around it. 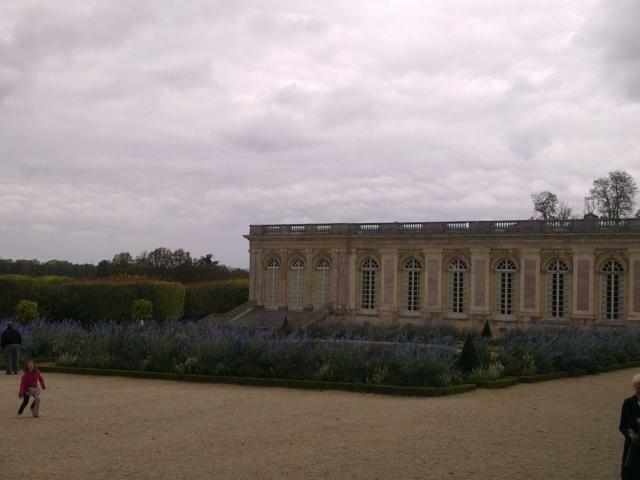 It imatates L'hameau de la Reine in the grounds of Versailles. This and all below image (c) Angela Cliffe. 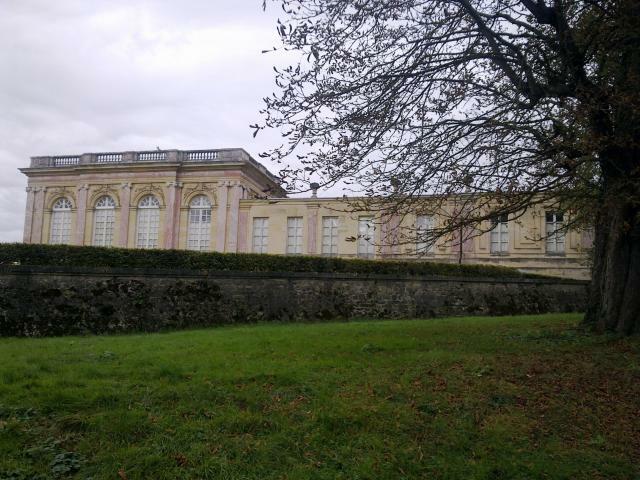 This is an external view of one of the ranges (actually the exterior of the ball room you can see below) of Le Petit Trianon. It sits above Lavender gardens and the smell at many times of the year in the Garden is beautiful. The title of the exhibition was 'The 18th Century back in Fashion'. Many designers collaborated in this fun exhibition and there is a strong feeling of the past and the future meeting in time. Alongside Dame Vivienne Karl Lagerfeld pour Chanel, Dior, Jean Paul Gaultier, Christian Lacroix, Olivier Theyskens pour Rochas, Martin Margiela, Azzedine Alaïa, Alexander McQueen pour Givenchy, Yohji Yamamoto, Thierry Mugler completed a stellar line up. These designers were all inspired by the 18th Century in the works included in the exhibit. 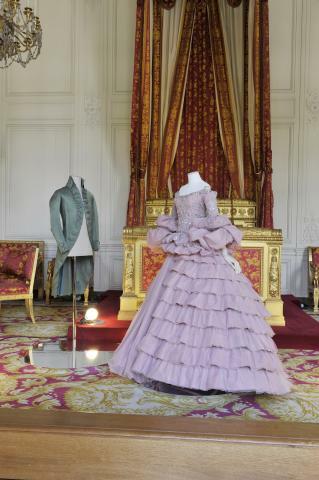 This is plaint o see I found myself wondering what the 18th Century members of the family who lived at different times at the Trianon would also have made of the clothes. I dare to think they would have been really interested in them. Karl Lagerfeld would fascinate anyone. Winding on through the little Palaces halls the Salon de la Chapelle hosted Couture from Pierre Balmain from his Spring-Summer 1954 collection. Close by was a captivating dress from Christian Dior Spring-Summer 1954 in Princess Soie Bleu. These two dresses were both a play on the 'robe a la Francaise' that came into fashion in France at the beginning of the 18th Century. Dans l'antichambre des seigneurs there were two very interesting pieces by Commes des Garcons from Autumn-Winter 10/11 and Jacques Douet from 1898-1900. This was brief journey into mens courtly style. Further in that room were 3 wonderful peices by Thierry Muglier, two Pret a Porter from Autumn-Winter 92-93 and an Haute Couture piece from Autumn-Winter 97-98. The playful Yohji Yamamoto also lent a Pret a Porter dress from Spring Summer 2008. I would urge you wherever you are in the world to consider coming to Paris to visit the Petit Trianon along with Versailles at some stage in your future. From Versailles there is a trolley car that can take you but if you can please do the 0.5/1k walk from the Palace through the grounds. It really is wonderful. More views of the Lavender beds restored to their former glory. 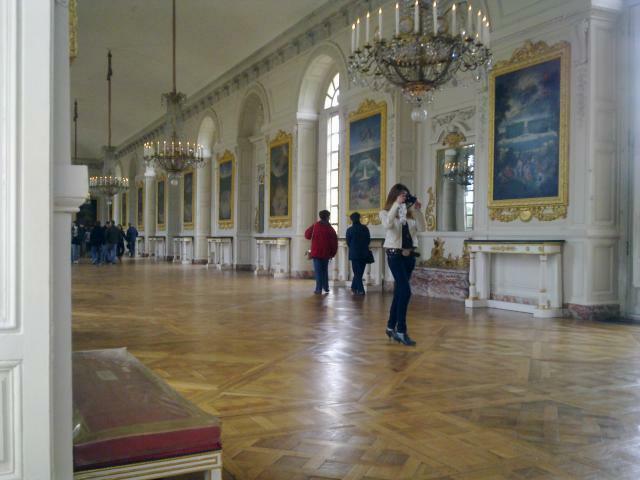 The tour of the mini Palace (for that is what it really is) continues with a tour of the Chambre de L'imperatrice. This Empress in Question was one of the Bonaparte family. It's important to remember that it wasn't just the Bourbon family who made Versailles their home. The Bonaparte also lived here for a shorter period of time. I believe from legend that Marie Antoinette's daughter who later married into another branch of the French Royal family may have lived here for a time also. Many years after her beloved mother who also known this home had died. Back to the Fashions. 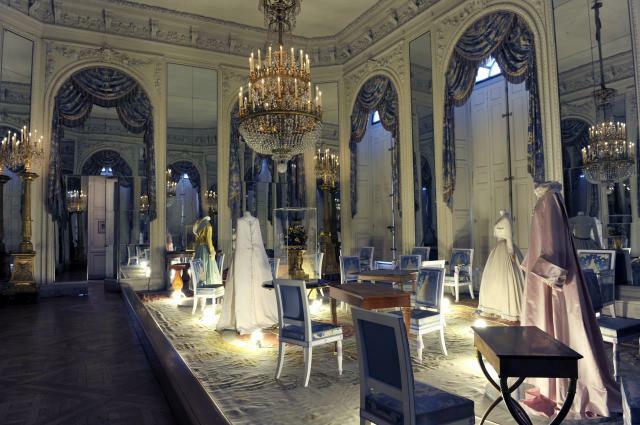 The Empress bedroom was wonderfully arrayed with three dresses by Nicolas Ghesquiere for Balenciaga. All Pret a Porter from Spring-Summer 2006. Sitting also in the same Chambre were two dresses by Azzidine Alaia from Spring-Summer 1992. I really liked both of them and thought they had a very English feel about them. 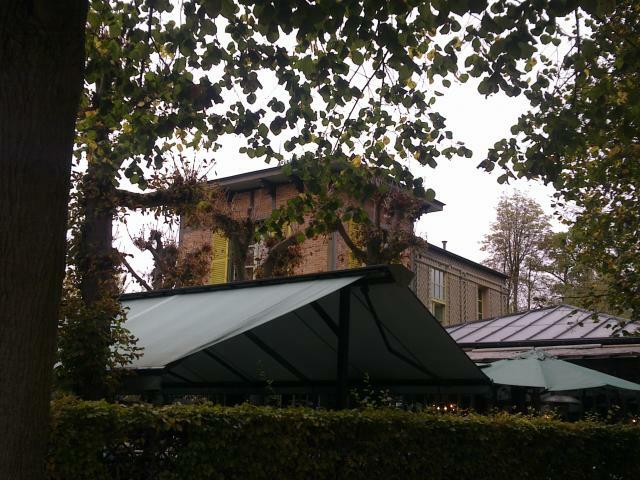 There are a series of apartments in the little Palace named for the Queen of the Belgians and the Salon de famille de l'Emperor. Again another reminder that several families inter-related passed through Versailles. Maison Martin Margeilla showed dresses from Spring-Summer 91 and 93 in these rooms. From Christian Dior there is a pale green silk dress with tuille and brocade from Haute Couture Spring- Summer 2011. Literally just of the catwalk at the start of this exhibition in the Summer. Yohji Yamamoto made a reappearance in the Salon de Music with interesting pieces in Hounds Tooth check. Three of his pieces were included here and they were some of the ones that visitors stopped to look at the most through the exhibition. There was also another piece by Olivier Theyskens for Rochas. 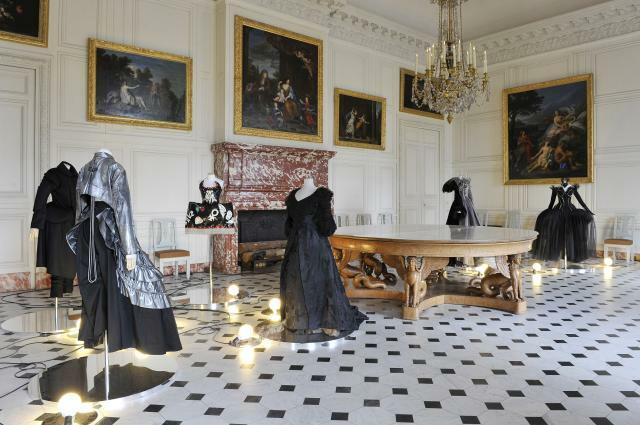 Jean Paul Gaultier was exhibited in the Salon des famille de (Roi) Louise-Philippe. Here is pieces struck a powerful juxtaposition with the traditional surrounding. It was very interesting to see how many designers works have played with the themes of 18th century dressing. The intriguing Salon des Malachites contained Christian Dior dresses from the Autumn-Winter 04-05 collection in a captivating Blue-Black. Midnight Blue is one of my favourite colours and works really well in an Autumn-Winter wardrobe. 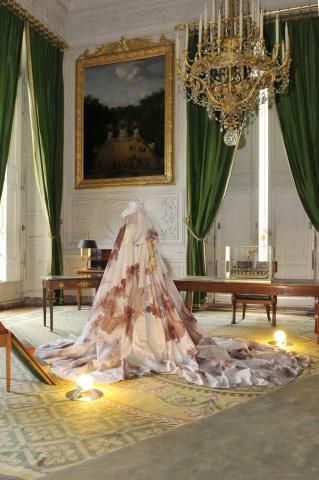 The last room held Christian La Croix with four wonderful Haute Couture pieces. Finally to close I saw two spectacular pieces from Vivienne Westwood designed in the style of the traditional dress Francaise. You can find out more about this exhibition and about visiting the Trianon in the future by following this link. 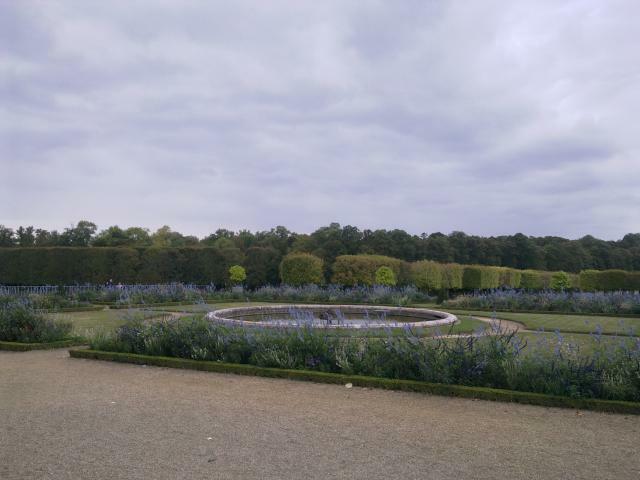 Versailles and Petit Trianon. Also here is a link to Breguet.com/en/">Breguet and I would recommend checking out their History pages. The Founder Monsieur Breguet made an amazing contribution to the history of scientific clock-making. He came to work for Louis XVIth and Marie Antoinette after presenting some of his clocks to them and showing how advanced his workmanship was for the era. Breguet also later created the first wrist watch. Below the tour ends in the ball room of the Palace. No dresses shown here but I think most of the visitors would imagine dancing in there in some of the pieces that they had just viewed. I certainly did. It's a wonderfully restored space and I hope it is used on many occasions.